What's actually in your cup of coffee? Chemex Originally created in the 1940s, this slow-and-steady approach to coffee brewing has made a comeback in the last few years. Just like a standard-drip machine, the Chemex method involves pouring hot water over coffee grounds. But the Chemex is special because it requires a filter that’s up to three times thicker. As a result, the finished coffee has smoother texture and purer flavor, with fewer fatty oils than what you’d get out of a standard-drip brew. The Chemex machine also keeps your water at a steady 180-200 degrees. Any hotter or colder, and the water will chemically alter the taste of your brew. Cold brewing, which is similar to the French press technique, has become trendy among today’s coffee connoisseurs. Unlike the French press, cold water is used in place of hot, and the grounds are steeped up to 12 hours. The finished product is a crisper, sweeter cup of coffee than the coffee-shop-special dark roast most of us are used to. That’s because cool water brings out the natural flavors in coffee’s oils that hot water chemically alters or takes away. Cold brewing also takes away some of the acid naturally found in coffee beans, which makes this method ideal for those who suffer from heart burn or acid reflux disease. If iced coffee isn’t your thing, make a stronger cup with cold water and then mix it with heated water or milk when you’re ready to drink. Looking for a morning jolt? 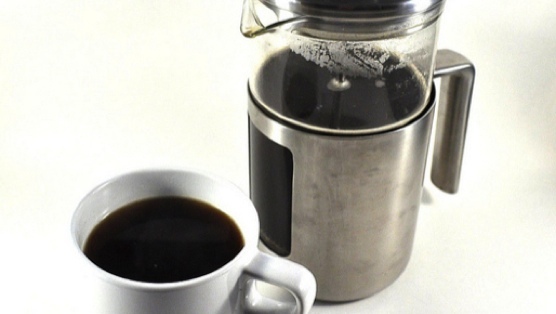 French press is one of your best bets —especially for those on the go. To brew, just throw some grounds in the pitcher, add heated water, and steep for five minutes. When you’re ready for a drink, push the strainer down, and out comes a freshly brewed cup of coffee. The longer and more thoroughly your grounds are steeped, the higher the caffeine content in your brew, making this method ideal for those in need of a serious early-morning wakeup call. But that extra caffeine comes at a cost. French pressed coffee contains higher amounts of Cafestol, the molecule in coffee that can cause cholesterol spikes. In fact, a 2002 study in the European Journal of Clinical Medicine found that people who drink four cups of French pressed coffee each day can experience an 8 to 10 percent increase in their cholesterol levels after just four weeks. The name doesn’t lie —just mix a spoonful of ground coffee powder with a cup of hot water, and you ’re ready to go in seconds. But since the instant mix isn’t technically coffee (it’s actually coffee extract that’s been freeze- or spray-dried), you’re missing out on the flavor and caffeine that comes with the real stuff. However, a 2012 study published in the Journal of Nutrition and Metabolism found that instant coffee is loaded with antioxidants that can help lower your blood-sugar levels and reduce your risk of developing type 2 diabetes. The ultimate solution for bleary-eyed students on the go, single-serve cups work just like the standard drip machine. But with this method, the coffee is already ground and pre-portioned. Just pop a little pod into the machine and you ’ll a have a steaming cup in less than five minutes. The difference here is in the type of pod you choose. Dark roast coffees contain the most cancer-fighting antioxidants, while light roasts tend to have a higher caffeine content. When shopping, make sure to double check the packaging, too. Aluminum pods can alter the flavor of your brew, as if you can almost taste a hint of metal. Opt for plastic packaging instead. The granddaddy of all brewing methods, a standard-drip brew involves pouring water over ground coffee beans in an automatic machine (think: your parents ’ Mr. Coffee pot). Many Americans prefer this method of brewing since it ’s fast, easy, and traditional. It ’s also one of the healthiest: The filter at the top of the machine absorbs most of the beans’ natural oils, which can do a number on your cholesterol over time. Unfortunately, these oils also trap flavonoids, the chemicals that give coffee the bold, earthy flavor we love. Recently popularized by the foodie community, the cowboy method of brewing coffee was once used only by serious campers and backpackers. The art is in heating coffee beans and water over a small flame (but a stovetop burner works, too). Right before the water begins to boil, sprinkle a handful of cool water into the pot and then pour the brew straight into mugs. In addition to being cheap and perfect for the great outdoors, this brewing method packs a serious flavor punch, since nothing is strained or filtered. However, some find the results a little too bitter; others don’t enjoy scraping up coffee grounds from the bottom of their cups. And because the cowboy method doesn’t involve filtering, mugs fill with all the oils and acids naturally found in coffee beans. But serious hikers and campers need the extra calories, anyway. Coffee is more than just a vessel for caffeine. A wide variety of beans, mix-ins and machines have recently turned coffee brewing into a delicate art. In fact, depending on how you make your morning cuppa, you’re toying with the flavor, nutrition and caffeine content. Here’s a look at seven common brewing methods—in order of most basic to most time-consuming—and what actually ends up in your cup.